I enjoyed spending my last night in New York at your establishment, including the complimentary breakfast. In the future, please make the distinction between the regular coffee and decaf coffee more obvious – with the visual equivalent of glitter and sirens. 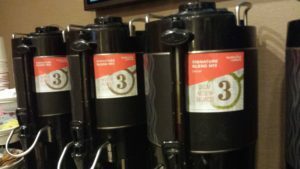 I’m sure Seattle’s Best Coffee put significant time and energy into making the labels on their dispensers beautiful, but the verbiage and coloration of the decaf coffee is too subtle for blurry-eyed un-caffeinated people. Before my first hit of caffeine all I can think is “Coffee-There-Gimme.” I barely had the mental capacity to properly put cream and sugar in my cup. (Shut up you people who drink it black.) I opened one of the mini-cups half-and-half and proceeded to pour its contents into the trash instead of my cup. Your coffee is delicious. (Thank you for not carrying that Starschmucks swill.) Thank goodness I came by the coffee counter to top off my cup before heading back upstairs. (What is this “thank goodness” crap. Everyone knows I need more than 1 cup of coffee to start my day. I’m just being nice.) By then the smell of coffee and the carbs from your delicious pancakes connected my cerebral synapses long enough to detect the subtle green “decaf” sign on the dispenser where I poured my first cup. (I would have been hurting by 10am if I didn’t get my daily caffeine fix.) I immediately threw that first cup in the bin and pour myself a cup of real coffee. In the future, please make the distinction between the real-deal coffee and decaf so obvious that that that actual reading of the dispensers is not required. Put a space between the dispensers and label them with big signs – a neon rainbow-colored sign on the “Real Deal Coffee” (it will be a beacon to your caffeine-addicted patrons, something like “This is the coffee you’re looking for.”) and “I don’t know why anyone wants decaf but here you go” sign on the decaf.